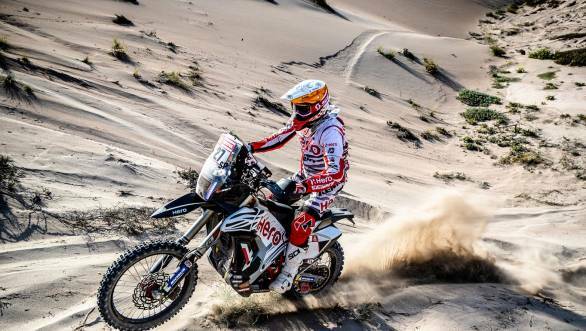 The 2019 Dakar Rally has entered the closing stages, with competitors travelling from San Juan de Marcona to Pisco for Stage 8 of the rally. It was a stage that made them tackle fog and dust aplenty, and necessitated fast riding too. And, given that it was the "Super Ica" stage, it meant that the 10 fastest competitors, across all categories (Cars, Moto, Trucks, Quads) started one behind the other in a mixed start format. This meant the challenge was greater for riders starting from behind, who had the dust that the leading pack was kicking up, in their faces. It was a good day for the Hero MotoSports Team Rally outfit, whose two riders, Joaquim 'JRod' Rodrigues and Oriol Mena rode well and finished strongly. Mena rode flawlessly, and managed to end the stage in 12th position, which meant that he broke into the top 10 in the overall standings. Speaking of his performance in Stage 8, Mena said, "When I started today, it looked like a difficult and dangerous stage so I decided to ride safe and steady with no crashes or mistakes. The Stage terrain was completely damaged due to the previous stage tracks and mixed start. So I focussed on my rhythm and rode more like an endure race with good speed and flow. I am really happy to be across the finish line today and now only two more days to go!" Meanwhile, JRod ended the eighth stage 13th, which means that he has moved up into 18th place in the overall standings. However, the day was a little more challenging for the Portuguese rider who had a hard landing after crossing a dune, and had to ride to the end of the stage in some amount of pain. "Today was a really difficult day with lot of fog in the mountain and lot of fesh-fesh with rocks making it extremely dangerous to push ahead. I encountered a dangerous large hole in the track, which wasn't mentioned in the roadbook. I hit the hole really hard and hurt my back. I am a little bit in pain but happy to finish the line and we see how it goes tomorrow," JRod said. 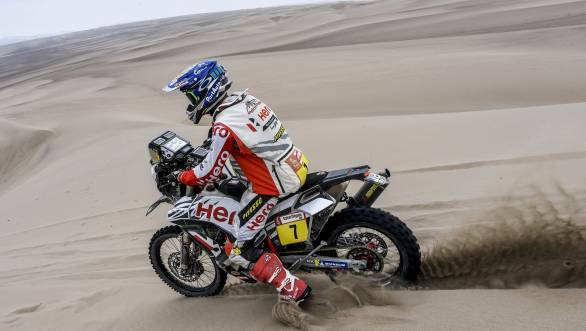 The penultimate stage of the Dakar 2019, will take place in Pisco with a mass start, for a 313km loop of special stage. The Rally will then move to the grand finale in Lima.